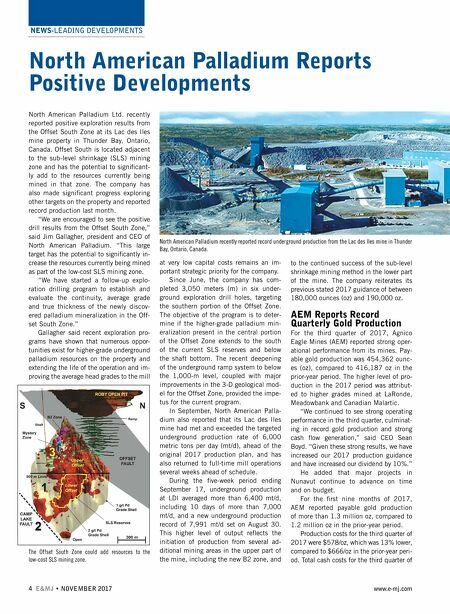 NEWS-LEADING DEVELOPMENTS 4 E&MJ • NOVEMBER 2017 www.e-mj.com North American Palladium Reports Positive Developments North American Palladium Ltd. recently reported positive exploration results from the Offset South Zone at its Lac des Iles mine property in Thunder Bay, Ontario, Canada. Offset South is located adjacent to the sub-level shrinkage (SLS) mining zone and has the potential to significant- ly add to the resources currently being mined in that zone. The company has also made significant progress exploring other targets on the property and reported record production last month. "We are encouraged to see the positive drill results from the Offset South Zone," said Jim Gallagher, president and CEO of North American Palladium. "This large target has the potential to significantly in- crease the resources currently being mined as part of the low-cost SLS mining zone. "We have started a follow-up explo- ration drilling program to establish and evaluate the continuity, average grade and true thickness of the newly discov- ered palladium mineralization in the Off- set South Zone." Gallagher said recent exploration pro- grams have shown that numerous oppor- tunities exist for higher-grade underground palladium resources on the property and extending the life of the operation and im- proving the average head grades to the mill at very low capital costs remains an im- portant strategic priority for the company. Since June, the company has com- pleted 3,050 meters (m) in six under- ground exploration drill holes, targeting the southern portion of the Offset Zone. The objective of the program is to deter- mine if the higher-grade palladium min- eralization present in the central portion of the Offset Zone extends to the south of the current SLS reserves and below the shaft bottom. The recent deepening of the underground ramp system to below the 1,000-m level, coupled with major improvements in the 3-D geological mod- el for the Offset Zone, provided the impe- tus for the current program. In September, North American Palla- dium also reported that its Lac des Iles mine had met and exceeded the targeted underground production rate of 6,000 metric tons per day (mt/d), ahead of the original 2017 production plan, and has also returned to full-time mill operations several weeks ahead of schedule. During the five-week period ending September 17, underground production at LDI averaged more than 6,400 mt/d, including 10 days of more than 7,000 mt/d, and a new underground production record of 7,991 mt/d set on August 30. This higher level of output reflects the initiation of production from several ad- ditional mining areas in the upper part of the mine, including the new B2 zone, and to the continued success of the sub-level shrinkage mining method in the lower part of the mine. The company reiterates its previous stated 2017 guidance of between 180,000 ounces (oz) and 190,000 oz. AEM Reports Record Quarterly Gold Production For the third quarter of 2017, Agnico Eagle Mines (AEM) reported strong oper- ational performance from its mines. Pay- able gold production was 454,362 ounc- es (oz), compared to 416,187 oz in the prior-year period. The higher level of pro- duction in the 2017 period was attribut- ed to higher grades mined at LaRonde, Meadowbank and Canadian Malartic. "We continued to see strong operating performance in the third quarter, culminat- ing in record gold production and strong cash flow generation," said CEO Sean Boyd. "Given these strong results, we have increased our 2017 production guidance and have increased our dividend by 10%." He added that major projects in Nunavut continue to advance on time and on budget. For the first nine months of 2017, AEM reported payable gold production of more than 1.3 million oz, compared to 1.2 million oz in the prior-year period. Production costs for the third quarter of 2017 were $578/oz, which was 13% lower, compared to $666/oz in the prior-year peri- od. Total cash costs for the third quarter of The Offset South Zone could add resources to the low-cost SLS mining zone. 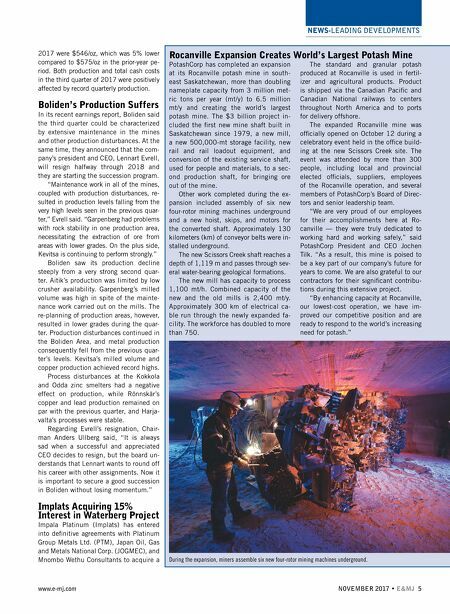 North American Palladium recently reported record underground production from the Lac des Iles mine in Thunder Bay, Ontario, Canada.